Joy Creek Photo Archive (c) all rights reserved The well-known Estonian hybridizer Uno Kvistik made this cross between C. 'Nelly Moser' and an unknown parent before 1987. 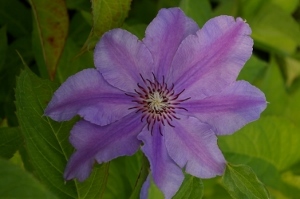 He subsequently registered the plant with the International Clematis Society around 1994. Blooming on both the old and new wood, Clematis 'Ilka' is a welcome addition to the list of clematis that have long-bloom periods. Flowers measure between 5 and 6 inches across. There is a bright central bar down each sepal. A showy boss of stamens with white filaments and red purple anther tips completes the picture. June; July to September. 6-8 ft.